Turns out the Incomparable Anne has an equally Incomparable Cousin named Susan, whom I've met on a couple of occasions over at Anne's. Aside from being an all-around nice gal, Susan also owns an establishment called The Black Cup Coffee Roaster, where they roast their own blends. 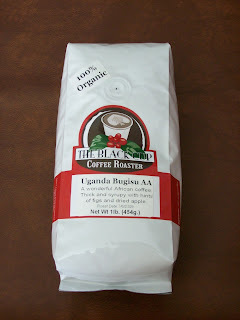 Susan very kindly sent the Smart Man and I a bag of "Uganda Bugisu AA, a wonderful African coffee. Thick and syrupy with hints of figs and dried apple." I can't wait to try it. I'm sure it will spoil my Navy blunted taste in coffee forevermore. Thanks, Susan! *You can purchase your very own The Black Cup Coffee Roaster coffee by following the link. So you really don't have to be envious unless you enjoy that sort of thing. Ditto - Susan rocks. And you have NO idea what you are in for (and how envious everyone should be!) . . . TBC (The Black Cup) Coffee is also incomparable.